If you are an user and want only search for yourself, you maybe want to use the Open Semantic Desktop Search virtual maschine or the encrypted Live-System InvestigateIX, which is easier to install for single end users. The Open Semantic Search Server installation tutorial shows how to setup a search engine as a public website or on an intranet server for admins running a Debian GNU/Linux or Ubuntu Linux (web)server or within an existing virtual maschine. 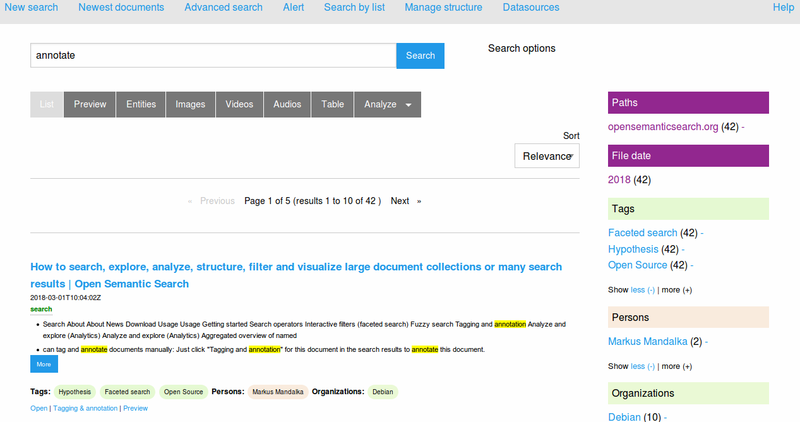 Enter a search query and enjoy the interactive userinterface for navigation, faceted search, exploratory search, interactive filters, analytics and visualizations. You will find flexible config options in the config files in /etc/opensemanticsearch/.